There has been a bit of talk recently about the new privacy thing brought in by the EU. I know this because I have been inundated with tons of shite from every company I have ever had dealings with telling me about their brand spanking new privacy policies. I just delete them because I don’t particularly care and can honestly think of better ways of spending my time. Anyhows, apparently we are all supposed to fall in with the new regulations. One of them is that I have to give commenters the option of remembering their own name with little check box thingy on the comment form. Now if you can’t remember your own name then should you really be on-line? Do you have to check the label on the back of your underpants to remind yourself who you are? Or do you just visit this here site to find your last comment and hence your name? Anyways, you now have the option to forget it for good. I would remove the option but the fuckers built it into the core software. I’m broadly in favour of it too. I would love to lay my hands on the cunts who added my email address to the database that spammers use. In general though it doesn’t affect me. They are more than welcome to mine my Farcebook, Twitter and Google accounts as most of the information there is either false or else is openly available here. Come to think of it, there is more information about me here than anywhere else on the Interwebs. I’m really pissed off with those incessant mails though. 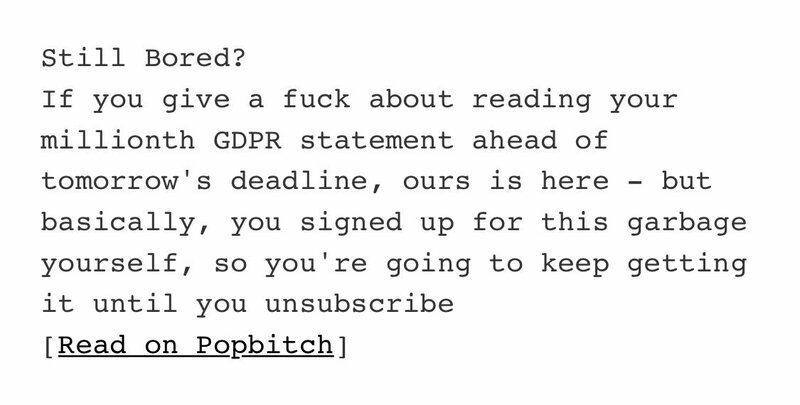 I’m thinking of adding “GDPR” to my spam filters, though they should tail off after the 25th.